On the 7th of April, the ‘Famiglia Maravilia’ took us on a journey around a few of the 6 000 Mediterranean islands, not just the well-known ones, but also many others that I, for one, had never heard about. The Famiglia Maravilia is an Italian family consisting of a father, a mother, a son and a daughter-in-law. I cherished every moment of this experience since it was extremely creative, and instead of teaching us about these islands in the normal way, they played different songs dedicated to certain islands, using some peculiar instruments I had never seen in my life before. First they started with the island of Gavdos, also known as the Island of Immortals. This island is found in Greece. Next up was the island of Sardegna, a well-known island in Italy. During this song, Francesco Sultana, one of the last few Maltese back pipers, was invited to join in. After this came another Italian island found in Rome which is called Tiberino. In this song, Francesco joined in, playing the Daf this time. The next song they played for us, reminds us of Malta, since the Sabir language is a mixture of various languages, like the Maltese language. The next song was dedicated to the island of Gerba. An island about which Erasmo Dreglia couldn’t stop talking about their food. Not just any food though, a certain recipe made from Arabic food but based on food having its roots from Naples. He explained how traditional people used to do a ritual; a sword dance as a challenge. They used to use sticks, swords, knives and even flutes, and since they are a family of music, Erasmo challenged Francesco into a sword dance with flutes, but as before not any normal flutes. This was one of my most favourite parts of the play since it involved upbeat music, a challenge and dancing, a great combination. He also explained how in the Mediterranean there are many islands which are all called ‘Ants’ in different languages, due to their size, and so came the song ‘Nemla’ (ant in Maltese). This song is in the Gregarian language and singing along with this song, is said to give good luck for the rest of the year, which I can use since my O’levels are around the corner. 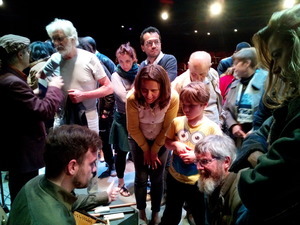 The following instruments were played during the performance: Hurdy-Gurdy, Nickel harp, Lira, Accordion, Sea shell, Trumpet-violin, autoharp and many others. My personal favourite were the hurdy-gurdy and the trumpet-violin. For such an astounding performance, I would have expected a larger audience. I hope that by sharing my blog, I have encouraged people to attend to future events. I would like to congratulate the Famiglia Maravilia along with Francesco Sultana for the amazing performance. 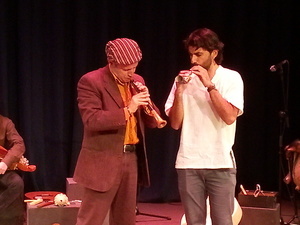 Everyone in the audience was amused by all the peculiar instruments and incredible talents and energy the artists had. I would also like to thank Valletta ‘18 for giving me the opportunity to go to such events and write from my point of view, and look forward to the upcoming events.